Chemotherapy medications are powerful drugs with dangerous side effects. But chemotherapy patients don't usually isolate themselves completely from babies or small children—nor should they. They should, however, use specific precautions not only to protect themselves from illnesses carried by the baby, but also to protect the baby from any ill effects from chemotherapy, including keeping chemotherapy pills far from any area where a baby could find and swallow them. Chemotherapy patients themselves do not pose a risk to babies, but babies may pose a risk to them, as direct contact with bodily fluids from chemotherapy patients can cause harm. Chemotherapy agents are present for as long as 48 hours after treatment in bodily fluids such as urine, tears, stool or vomit, according to the Cleveland Clinic. Exposure to these fluids may pose a risk of absorption for an infant exposed to them. Chemotherapy drugs have also been found on the outside of vials, on floors, doorknobs and garbage cans, MSNBC reports. Chemotherapy patients should carefully wash their hands after using the toilet to avoid contamination of other surfaces. Toilets should be flushed twice or, if possible, a separate toilet should be used by the person undergoing chemotherapy. A baby visiting a patient undergoing chemotherapy should not be allowed to touch potentially contaminated surfaces in the room. If a baby comes in contact with potentially contaminated body fluids or surfaces, wash the area touched thoroughly with warm water and soap. Recent studies show that medical workers repeatedly exposed to chemotherapy agents may have a higher risk of developing cancer than those who don't, MSNBC reports. While a single exposure to a chemotherapy drug probably won't have any lasting effects, the Cleveland Clinic states, repeated exposures must be avoided. The person undergoing chemotherapy does not pose any danger to a baby. 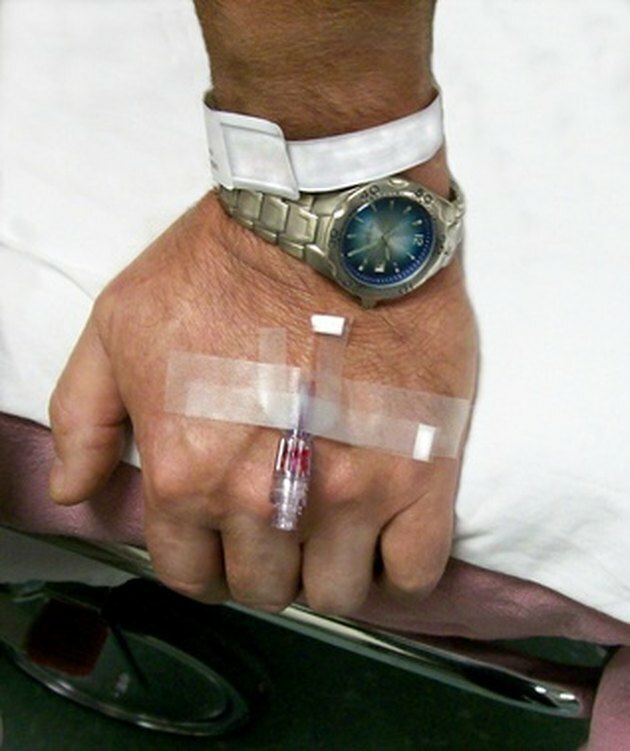 A person receiving chemotherapy has a higher than normal susceptibility to infection. A sick baby could pass bacteria or viruses on to a person going through chemotherapy. Even a cold can cause serious illness in a person undergoing chemotherapy, so a baby with even a case of the sniffles should stay away from a person receiving chemotherapy. Babies who have recently had measles, chickenpox or polio vaccines should not visit people undergoing chemotherapy, the National Cancer Institute states. A person undergoing chemotherapy should wear a mask to avoid airborne contamination when around a baby.